Raheem Sterling is acting as an inspiration to Jadon Sancho and England's next generation of stars. Manchester City forward Sterling continued his scintillating recent form with a hat-trick for Gareth Southgate's side against the Czech Republic on Friday, also winning a penalty that was converted by captain Harry Kane in a 5-0 Euro 2020 qualification rout. Sancho was handed a full competitive debut and responded by laying on Sterling's 24th-minute breakthrough goal amid an eye-catching display. The teenager, who turns 19 when England face Montenegro on Monday, has been a revelation in the Bundesliga this season for Borussia Dortmund. Despite turning his back on a professional deal with City in 2017, Sancho and Sterling remain close. 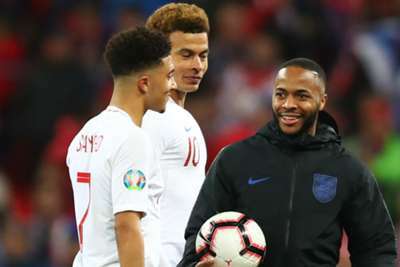 Southgate revealed Sterling had been added to the leadership group in his England squad and a role as mentor to the likes of Sancho and Callum Hudson-Odoi - the Chelsea winger who made his debut from the bench in the Czech game - appears to come naturally to the 24-year-old. "He is a great player; he is showing all the youngsters what it's about and I am sure that he is going to go far in his career," Sancho said. "I'm just happy I'm sharing a pitch with him. "His numbers are crazy this year, I'm just happy for him. "He's cool, he speaks to me and Callum about what to do and what not to do and he gives us advice. "It's very good, especially as he is from London as well. He knows the background I've come from. "He's been helping me a lot, but it's not just him. Everyone has made me and Callum comfortable and made us feel welcome." Although Sancho joked his assist to set in motion Sterling's treble laid on "an easy goal I think anyone would have been able to score", he felt there was room for improvement in his overall display after an injury to Manchester United's Marcus Rashford opened up a spot in the England front three. "I think it could have gone better, my one-v-ones weren't sharp, but I am just happy that I'm on the pitch and starting my first competitive game, and happy to assist the first goal," he said. "I've got a lot of improvements to make on the pitch and in the next game against Montenegro, if I get the chance, I am sure I'll do better." City manager Pep Guardiola, who has overseen Sterling's rapid development into an indispensable star for club and country, last week claimed Sancho "didn't want the challenge" of winning a place in a talent-stacked first-team squad at the Etihad Stadium. When this was put to the England youngster, he was in no mood to be drawn into a war of words. "I didn't read that. That's his opinion, I am just happy at Borussia Dortmund at the moment and I am just happy that I am playing," Sancho added.